Have you ever gotten tired of the vanilla potion effects? Wanted something new and interesting? Well then this mod has plenty to offer! This mod contains a whole bunch of potion effects that I plan to use in some other mods! There is no way to get the potions besides the creative menu in this mod (since this is just a core mod), but check out Not Enough Potions, which has recipes and new brewing mechanics. Trueshot - Increases projectile damage (like how strength increases melee damage). Klutz - Decreases projectile damage (like how weakness decreases melee damage). Magic Focus - Increases magic damage (like how strength increases melee damage). Magic Inhibition - Decreases magic damage (like how weakness decreases melee damage). Recoil - Reflects a portion of damage back to the attacker. Burst - Makes you explode but doesn't hurt you (only your enemies), and doesn't do block damage. Combustion - Sets you on fire. Lightning - Strikes you with lightning. Launch - Shoots you up into the air. Vulnerability - Increases all damage to you (like how resistance decreases all damage to you). Solid Core - Gives you knockback resistance. Revival - If you die with this effect on, you will revive with 2 hearts per level. Slowfall - Slows your fall and prevents some fall damage at level 1, and all fall damage at level 2. Step Up - Increases your step height so you can step up a full block. Reach - Increases your reach distance. Climbing - Lets you climb walls like spiders. Corrosion - Damages your armor and held item (except for gold items/armor). Repairing - Repairs your armor and held item. Flight - Lets you fly like in creative mode. Random Teleport - Teleports you to a nearby location. Surface Teleport - Teleports you to the top surface block. Spawn Teleport - Teleports you to your spawn point if you stand still with it for 10 seconds. Love - Causes breedable entities to breed with eachother. Antidote - Prevents you from taking poison damage. Purity - Prevents you from taking wither damage. Drowning - Makes you only breath underwater. Weight - Negative jump boost; makes it so you can't jump up a full block. Perplexity - Reverses your controls so forwards is backwards, sneak is jump, etc. Extension - Prevents one other potion on you from ticking down per level. Essentially doubles the length of another potion on you. Chance - Gives you one random potion effect (could be good or bad). Bless - Gives you one random good potion effect. Curse - Gives you one random bad potion effect. Cure - Clears all bad potion effects from you. Dispel - Clears all good potion effects from you. Inversion - Inverts all potion effects on you (like regeneration -> wither, strength -> weakness, etc.). Potion Sickness - Disabled by default. Has a low chance of giving you a random bad potion effect. Blindness - Now the fog comes closer per level (making you more blind), and it also affects mobs, so they won't attack you unless you are close to them. Jump Boost - You can control how high you jump by holding down the space bar, so you can jump up one block instead of shooting into the air. What it does: Represents your dig speed. Used by the vanilla haste potion (mining fatigue doesn't use it, since it's effects aren't linear). Reach: Removed in 1.12 onwards! Use forge's generic.reachDistance instead! What it does: Represents your magic 'armor', which protects you from magic damage (since magic damage penetrates normal armor). Used by the magic shield potion. There's also a new potion mechanic, Potion Sickness, that limits how many beneficial potions you can drink at once (in case you don't want to get too overpowered). After you reach a certain configurable number of good potion effects, you will get potion sickness, which will rarely give you bad potion effects as long as you have it. So if you are too greedy, you could literally blow yourself up. It is disabled by default; you can enable it in the config file. This is a regular mod; just install forge and then drop this in your mods folder! If you don't know how to install forge, there are many tutorials out there. Yes, this is allowed in modpacks. Just link back to curse or minecraftforum, and list me as the author. There is an old beta version for 1.7.10. I don't plan to update it further, but it's there if you really want a version for 1.7.10. Scrolling down to the related files on the bottom. Download both the deobf and sources files. In your forge dev environment, create a libs folder. Drag both files into the libs folder. It should now be loaded at the bottom of Referenced Libraries. Try to open a class, click Add Source, and point it to the sources file. It should now be loaded as a library. If you find a bug, or want to leave a comment, you should do so on the minecraftforum page, as I will look at it more often. Hey, yeah, when I added the attribute, I left the dig speed at the default for an attribute, which I believe is maximum +- 1024. I had no idea that there were mods out there that actually intended for you to digs blocks with hardness that high O.o... I'll see if I can add a config option to change the max dig speed for the next update. Would it be possible to add support to Overloaded Armor Bar & Overpowered Toughness Bar? Those two mods adds in their own Armor & Toughness Overlays which are configurable to go higher than the overlays with Potion Core's Overlay, which for that only goes up to 40 Armor & 20 Toughness. In this image here... with a slight mock-up. The Resistance overlay apparently works fine with "Overloaded Armor Bar" however the Magic Shield overlay won't show on it. Toughness I'm not worried about since the shield icons on the right is the Armor Toughness from "Overpowered Toughness Bar". One idea is to render the Magic Shield Overlay over the Toughness Bar although I couldn't get the custom rendering to overlap it via a mock-up so I just drew a pinkish outline over it. I also added in the textures at the bottom. Iron-ish is 20 while Copper-ish Color is 40. These icons can be changed via the config. The icons with the tiny yellow hearts overlay is Absorption due to Scaling Health's custom rendering which also changes the Health overlay. This doesn't affect anything but figure I put a mention if asked about it. Hey, that's not a bad suggestion. I'm a bit too busy to work on that at the moment, but I'll keep it in mind! Is it possible for you to make a "bow draw back speed" attribute, similar to attack speed? Hey, unfortunately it wouldn't be easy, and likely would not play well with modded bows, or other mods that add draw speed enchantments. When using Mob Battle Mod and making mobs fight, i eventually get an error message about incompatability between Potion Core and that mod, which prevents further use of Mob Battle Mod items. Any ideas? Edit: if you would like, I can give the error report. Hey, yeah, if you can send over the crash report or errors printing out in the logs that would be quite helpful. You can put it in the Issues section here if you want. Hey! I'm getting a "Fatally missing registry entries" error when adding this mod to a Forge Server (1.2.2 - 14.23.5.2814 version), which is weird because in single mode works perfectly. Any ideas? Hey! Could you send the crash report? Or at least the error printing out in the client or server log? If you want, you can put it in the Issues section here. Welp, I don't know what happened but I tried again and know it works! In any case, thanks for the quick response and attention! Updating Not Enough Potions anytime soon? 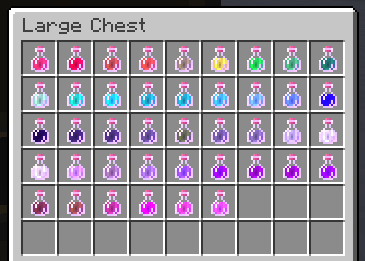 I would really like to craft all of these amazing potions :) . Would it be possible, to have separate on/off config entries for the armor bar overlay? Death loop bug if used with Progressive Bosses mod. Is there a full list of effect names somewhere? I seem too stupid to find it. Hey, there isn't a list here, but the names are listed in the config file. 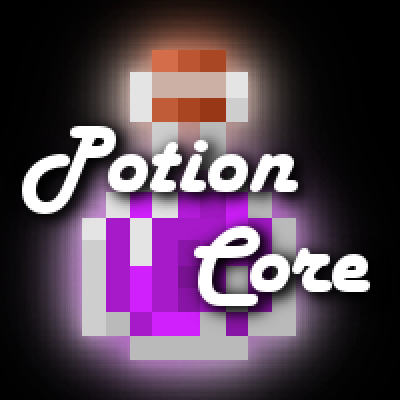 You could also do the /effect command ingame and start it out with potioncore: and hit tab.